Precision technology has driven the farming revolution in recent years. Monitoring crops from the sky using agricultural drones looks set to drive the next, as agronomists, agricultural engineers and farmers turn to UAVs (or UAS) to gain more efficient crop insights and to more accurately plan and manage their operations. Durable senseFly drone technology adds value throughout the growing season, from monitoring plant emergence right through to pre-harvest yield prediction and drainage planning for the next season. 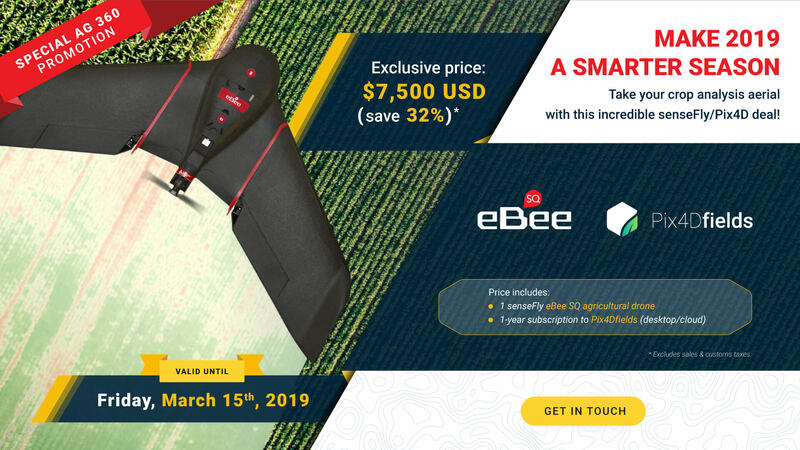 A professional UAV, such as the multispectral eBee SQ agriculture drone, provides a holistic view of a crop’s growth, enabling ag professionals to quickly and precisely identify issues, and better target their field scouting. Multi-year drone data also allows the better planning and monitoring of improvements, such as ditches and evolving fertiliser applications. Drone data can be employed to extract soil characteristics. These include temperature, moisture, slope, elevation and more. This ability enables more accurate soil sampling and the production of more suitable seeding prescriptions. Professionals like agronomists are increasingly using the data from agricultural drones to better understand which plants emerge, as well as population and spacing metrics. This information is then used to drive replanting decisions, thinning and pruning activity, and to improve crop models. High-resolution drone data allows ag professionals to assess crop vigour at different stages of growth. This helps teams to apply just the right rates of fertiliser, reduce wastage and optimise crop health and production. The digital outputs generated by agricultural drones (using software such as Pix4Dfields) when assessing stress and crop growth can help to guide the proper and efficient application of crop protection products. This allows for finely-tuned applications that meet the exact needs of each acre. On-demand, high-resolution drone data is perfect for capturing and accurately reporting events that lead to economic loss, such as crop injury, destruction and reduced health, helping to create a more efficient adjustment process. In addition to crop-specific activities such as health monitoring, agricultural drones equipped with RGB and/or thermal infrared cameras can also be used to plan and troubleshoot irrigation systems. This, in turn, helps professionals to manage their water flow and usage across an operation. Drone data, collected at critical growth stages throughout the growing season, can help agronomists and ag engineers to improve their models, predictions and planning. The result is that teams can better anticipate both a harvest’s quality and its final yield. Durable senseFly drone technology adds value throughout the growing season, from emergency and early growth assessments through to pre-harvest yield prediction. Dr. Berezovskiy's team at Timiryazev State Agragrian University used an eBee farming drone to capture high-resolution imagery of their wheat fertilisation project. The subsequent application map allowed them to optimise their nitrogen application, reducing its input by 20%. "When used as a tool to scout more efficiently and reduce fertiliser waste, we’ve found that UAVs can create an ROI of around $9 per acre. They allow us to concentrate our scouting efforts in the less healthy areas of the field, find the cause of crop stress and make a treatment before the crop stress translates to yield loss."